The Midcoast Conservancy will use the U.S. Forest Service money to buy the land it now leases for the Hidden Valley Nature Center. 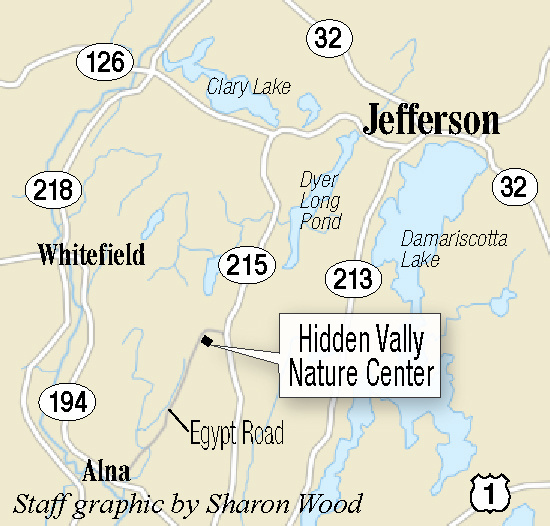 The Hidden Valley Nature Center in Jefferson operates on private land its parent organization leases from the land’s owner, but that’s about to change. The Midcoast Conservancy recently was awarded a $400,000 grant it will use toward the purchase of the center’s 1,000 acres in Jefferson. A spokeswoman for the organization didn’t respond to a request for comment. The grant was awarded by the U.S. Forest Service as part of the Community Forest and Open Space Conservation Program, which provides grants to local governments, tribes and qualified nonprofit organizations to establish community forests that will provide economic and environmental benefits as well as education, stewardship and recreation opportunities. “We are thrilled that the U.S. Forest Service appreciates what a special place we have in the Nature Center,” the Midcoast Conservancy board chairwoman, Susan Russell, said in a news release. U.S. Forest Service Deputy Chief of State and Private Forestry Vicki Christiansen said the proposals they received grew directly from the communities that presented them. “They will become important economic, recreational, and educational cornerstones of their communities,” she said. According to terms of the grant, all projects selected must guarantee public access and community members must be involved in developing a forest plan to determine the long-term goals for the forests. Midcoast Conservancy received support from U.S. Sens. Susan Collins and Angus King, U.S. Rep. Chellie Pingree, the American Forest Foundation, the town of Jefferson, Whitefield Elementary School, Juniper Hill School and the Central Lincoln County YMCA. Hidden Valley Nature Center and the Midcoast Conservancy joined forces last year. Executive Director Jody Jones said this grant is further proof of that the merger has been a success. Currently, the conservancy leases the land for the nature center from private owners. It functions as a community forest for more than 10 nearby towns by employing and demonstrating Forest Stewardship Council-certified sustainable forestry practices. It shares ways to use forest products to support livelihoods, providing employment through forestry, recreation, and place-based educational programming, engaging area schools and nonprofits in experiential learning at the Nature Center, offering community-driven programming to build recreational skills and place-based knowledge, and providing accessible recreational opportunities. The release states that the receipt of the grant money is a significant step for the conservancy toward ensuring public access for future generations.